Squats are a very powerful type of strength exercise because they allow one to target many muscle groups at once; knowing how to do squats the right way will increase their effect and reduce the chance of injury. One of the best things about squats is they can be done without any weights whatsoever, making them a simple at-home exercise with a very effective result. It's important to remember several things when doing squat exercises. Many different types of squats are detailed below; however, it's important to remember these basics no matter which type of squat you decide to work into your exercise routine. These basics are about how to do squats of all different types. Whether you go for the simplest squats without any dumbbells or barbells involved, or you tackle the more advanced squat with the barbell in front of your torso, these tips are the basics for safety and efficacy. Different squats are better for different types of exercisers. Squats are versatile because there's a type of squat good for every level of physical fitness. In general, it's a good idea to start out with the basic 'chair squat' if you are new to squats. After practicing this one for some time, you'll probably want to move up to more advanced squats, such as those with dumbbells and eventually ones with barbells. You can even do squats on one leg if you really want to challenge yourself! As with all exercise routines, push yourself gently instead of pushing yourself over the limit. This squat mimics getting up from a chair and sitting down in it. In this sense, the exercise is quite basic and extremely practical, and doesn't feel much like the typical strength training workout. On the other hand, there are ways to make this action an exercise that will produce muscular results, such as the number of reps that you do and how quickly or slowly you do it. Of course, if your hands are holding onto a table in front of you or the arms of your chair, the amount of work done by your legs is reduced or eliminated. To perform this squat, place an armless chair directly behind you, your feet hip-distance apart, and your arms extended straight in front of your body. Bend slightly forward at the waist to contract your abs, glutes and thighs, and slowly lower onto the chair. Do the opposite to lift your bottom back up off the chair. Doing three sets of 12-16 reps of this exercise will have you feeling those muscles for sure! Using one or two dumbbells can increase the intensity of your squats. The basic squat is similar to the chair squat above (although it should be done without a chair). Instead of holding your arms straight out in front of you, you can either hold one dumbbell down towards the ground, using both hands to hold it, or you can use two dumbbells, one in each hand, held below your ears on each side of your neck. 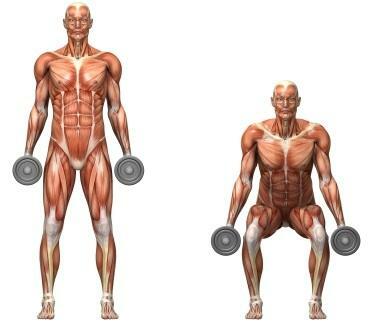 In the single-dumbbell version, the dumbbell will come down towards the ground between your legs as you squat down. Two dumbbells, when held in each hand, will stay next to your neck as you squat downwards. Remembering the basics on stability and safety becomes even more important when you start incorporating weights into your routine. Traditionally, barbell squats are done holding a barbell behind you, with the barbell supported on the trapezius. This is a difficult version of the squat that should be only undertaken by those who've mastered the previous types of squat exercises; try it for the first time with light weights on the bar and with a spotter close by. The even more difficult barbell squat is done holding the bar in front of the body with the arms crossed over it. This has additional benefits beyond the basic benefits of doing squats. Squats can offer great strength training results. Remember the basics in order to keep your body safe while practicing this highly-effective lower-body strength exercise.